Yoga is a practice of exercises, breathing techniques, and meditation that started in ancient India. It has been touted as a way to boost mental and physical health for the past thousands of years. In fact, yoga is proven to help people with arthritis. It improves many physical and psychological symptoms of arthritis. If you are suffering from arthritis and it is making hard for you to do even the simplest things, you surely need to carry out some exercises. Arthritis is a joint disorder that causes inflammation. A joint is an area in the body where two bones meet. It allows movement of the body parts it connects. When there is an inflammation of joints, it gives rise to arthritis. 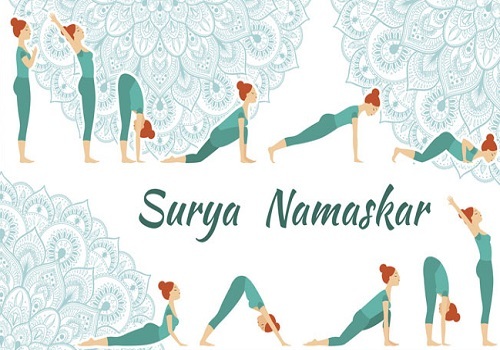 Surya Namaskara: It is one of the best yoga asanas that need to be carried out in a continuous flow synchronized with breath. It is extremely beneficial for relieving the pain of arthritis. There are 11 steps involved in this asana. Stand at the edge of the mat and join your feet together, balancing the weight on the feet equally. While inhaling, lift both arms upwards from sides and then bring the palm together in front of the chest just like you are doing a prayer. This is done when breathing air in and then lifting arms up and back, all the while keeping the biceps together and close to ears. The aim of this pose is to stretch the whole body up from heels to fingertips. When you are exhaling, try to bend forward from the waist all the while keeping the spine straight. After finishing out the exhalation completely, bring the hands down to the floor beside the feet. Inhale air and push the left leg backward as far as possible and after that bring your right knee to the floor and try to look up. With inhalation, take your left leg backward and also bring the whole body in a straight line. You have to bring the knees down to the floor and breathe out. Move your hips backwards a little and slide a bit forward resting the chest and chin on the floor. Raise the rear end of your body little bit so that both your hands, both feet, knees, chest as well as chin are touching the floor. You have to slide forward and raise your chest up into a Cobra’s posture. You can bend the elbows while doing the pose. The shoulders need to be away from the ears. After that, try to look upwards. Here, we lift the hips and tailbone upwards and move the chest downwards in an inverted “V” shape. All you have to do in this pose is bring your left foot forward by keeping the palms on the floor. Keep exhaling at the same time. If you want, you can bend the knees. While breathing, the spine goes up, your hands go up and the body is bent backward slightly, pushing hips slightly in the outward direction. Step 11: This is the last stage of Surya namaskar. It is called Tadasana. Straighten your body first in this step, and bring your arms back down while exhaling. Relax in this position and try to observe the sensations passing throughout your body. Surya Namaskara is the best pose for improving the blood circulation. It also helps in bringing the natural glow on your face, preventing the onset of wrinkles making your skin look young, radiant and ageless. It helps in treating the arthritis swelling or pain. If you also got benefited after doing these asanas, comment in the section below.